Cables provide power to sky-high airplanes, underground mines, and offshore wind farms. Depending on the use case, cables can have vastly different shapes, sizes, and environments — all of which affect their performance. 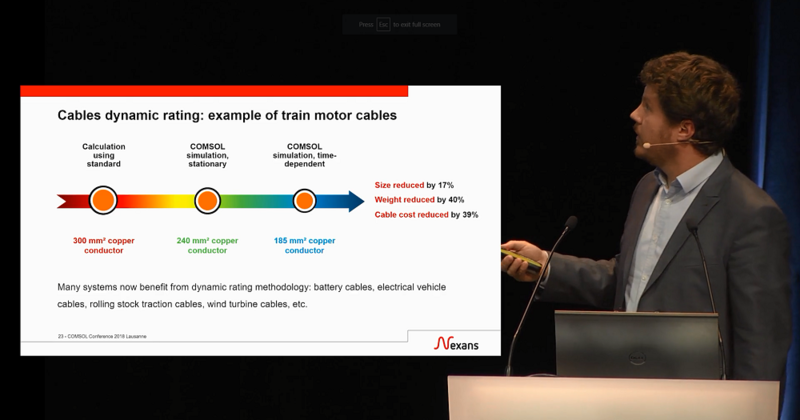 In his keynote talk at the COMSOL Conference 2018 Lausanne, Adrien Charmetant of Nexans explained how multiphysics modeling is used to optimize cable designs. Below, you can find a summary and video of his presentation. Nexans is a global supplier of cable solutions, helping to transmit power and information to millions of people. Their cables and accessories are used for hydroelectric dams, mines, offshore wind farms, data centers, city skyscrapers, as well as transportation. The length of cable for a specific mode of transportation depends on the average amount of passengers, according to Adrien Charmetant, head of the numerical simulation department at Nexans — around 1 kilometer (km) per passenger. For instance, a car uses ~5 km of cable, whereas a cruise ship uses ~5000 km. When designing cables for these and other use cases, engineers must account for several factors. For instance, Charmetant mentioned how the power transmission of a cable isn’t an intrinsic property but is instead dependent on the environment. So, if you install a cable in the air, it could have twice the power transmission of an underground cable. To account for the coupled behavior of cables, Charmetant and his team use simulation “as a complement to standards.” He noted that the COMSOL Multiphysics® software helps them solve complex physics with fewer approximations. “It allows faster time to market and cheaper development of new cables and new accessories,” said Charmetant. In addition, modeling enables cost-optimized and safer cable installations and helps prevent overheating. Other benefits include the versatility of multiphysics simulation and the ability to bring complex design methodologies to a wider audience through simulation applications. Charmetant went on to discuss two ways Nexans uses modeling to improve the development process for cables and their accessories: virtual prototyping, which streamlines the design of these devices, and dynamic analysis, which helps make cable installation more cost effective. Virtual prototyping enables Nexans to improve the time to market for R&D projects. As an example, Charmetant shared how his team used simulation to design a standard submarine cable plug. 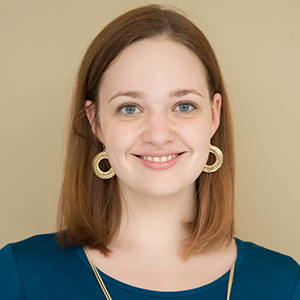 To ensure that the maximum operating temperature aligned with the lifetime of the materials, they solved the strongly coupled (and nonlinear) thermal-magnetic problem. The resulting simulation allowed the team to visualize the temperature distribution, which in turn helped them detect a potential overheating issue. By catching this problem early in the design process, the engineers avoided having to create a prototype that would be “expensive to manufacture and to test,” and instead go straight to a redesign phase. 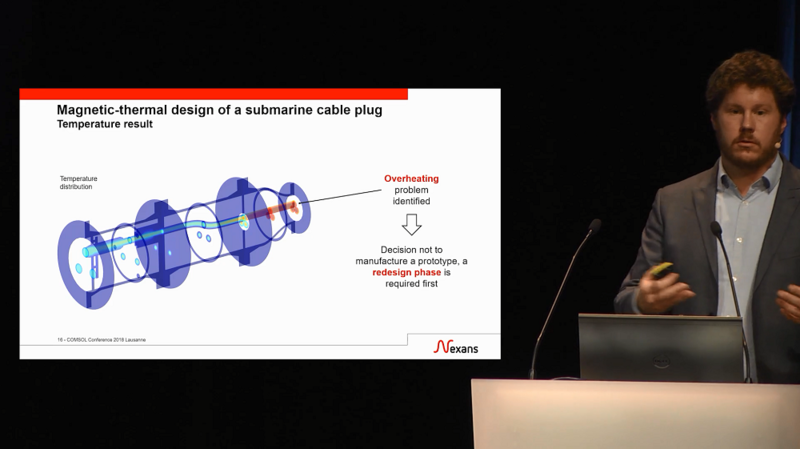 From the video: Adrien Charmetant discusses using simulation to detect an overheating issue in the design of a submarine cable plug. Another example Charmetant discussed was the influence of using three cable trays for cable installation. Here, the team included losses as well as convective and radiative heat transfer to ensure that the cable would operate properly and achieve the desired lifetime. After calculating the mutual heating of the trays, Charmetant noted that the lowest tray set air in a vertical motion while also increasing its temperature. The net result of these phenomena reduced the temperature on the higher cable trays, which the engineers hadn’t anticipated. Nexans also uses simulation for dynamic analysis, which contributes to improving the cost effectiveness of cable installation. The idea is to benefit from the fact that electrical loads change with time and, in some cases, thermal inertia helps filter these loads. For each load change, cables with slow variations and low inertia reach a stable temperature, as do ones with fast variations and a high thermal inertia. However, for cables in between these extremes, loads can change in such a way that the temperature never reaches a steady state. Charmetant said that in these cases, dynamic (or time-dependent) analysis can be helpful. From the video: Adrien Charmetant discusses the benefits of using a dynamic cable rating methodology in COMSOL Multiphysics. Nexans uses simulation to improve the development and installation process for cables and cable accessories, which helps them save both time and money. To learn more about how they use multiphysics modeling, watch the keynote video at the top of this post.